As you’ll doubtless glean by even the most cursory perusal of the links above, Rhône-style wines come in many forms. First of all, there are the true Rhône wines, produced in the Rhône Valley of south-eastern France. 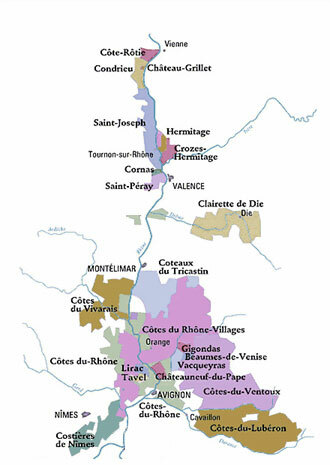 This storied region includes such familiar names as Côtes-du-Rhône, Gigondas, Côtes-du-Lúberon, and Chateauneuf-du-Pape, all located in the Southern Rhône, and Hermitage, Saint-Joseph, and Côte-Rôtie in the North. While the northern regions use only Syrah in producing their red wines, the southern regions blend up to five grapes: Grenache, Syrah, Mourvedre, Cinsaut, and Carignan. These grapes thus constitute the red “Rhône varietals” (here’s a map of the Rhône, which you will likely be quizzed on). The cool thing about the Rhône grapes is that they’ve been adopted by innovative producers all over the world (including California’s Rhône-happy group of “Rhone Rangers”). It’s therefore possible to find Rhône-style red blends — i.e. wines made from two or more of the five grape varieties listed above — made in the US, in Australia, and elsewhere. These wines take the great qualities of the Rhône wines, such as their dense smokiness and their meaty-yet-fruity flavors, and project them onto the characteristics of the local terroir… often to delicious effect. We’ll be meeting at Allison’s apartment in Hermosa Beach. The RSVP situation is as follows: new members have eight spots reserved for them at each and every meeting, with preference within those spots given to newbies who were denied admittance due to space constraints in recent weeks. Please do not RSVP in the positive if you’re not sure you can make it, as this will deny someone else the opportunity of attending the meeting. If you do RSVP and then need to cancel, please inform me as soon as possible. Once you get your confirmation e-mail, head out and find a delicious bottle of Rhône-style red, whether French or otherwise — or simply bring along one of those tasty $10 donations. We’ll see you on Wednesday night at 9:00.